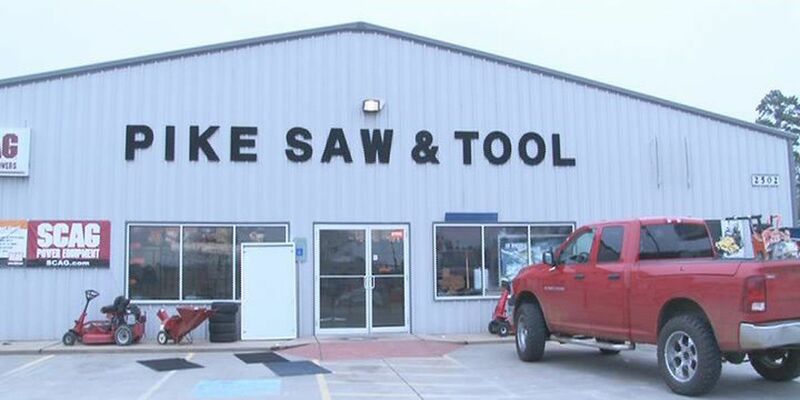 A high-speed chase in Nacogdoches over the weekend led police straight to stolen merchandise from the Pike Saw and Tool Company. David Lymbery is the owner of the Pike Saw and Tool Company in Nacogdoches. He has owned the company for 10 years, and he said it's his pride and joy. "My dad started working here in 1970 and eventually bought the company in 1981, and then I bought it from him in 2004," said Lymbery. On Sunday, the family-owned business was targeted. "My alarm company called me that morning, and when I came to work, I noticed that all the glass to the front door was gone," Lymbery said. As investigators began collecting evidence of the burglary, there was a break in the case. Sergeant Greg Sowell with the Nacogdoches Police Department said one his patrol units noticed a van driving at high speeds off the loop. "When the officer attempted to stop the van, the van began to speed up," Sowell said. "The driver tried to evade the officer and then exited the loop onto South 59 and began heading South and then abruptly pulled in a field or wooded area." Sowell said the driver then ran into the woods and the pursuit began on foot. Although the man escaped authorities, he led them straight to the stolen goods taken from Lymbery's shop. About $10,000 worth of merchandise was returned. "Getting the equipment back was great, but the insurance doesn't cover the cost of the window," Lymbery said. Lymbery had to pay for the cost of the window out of his own pocket. Sowell said the suspect's van was from Houston. As of now, they have no leads on who the driver might be.